For those cool summer days it’s sometimes nice to have a heated pool — but usually pretty expensive too. Looking for a simpler solution [Martin] came up with his own solar pool heater for under $100! He’s copied the basic design of a solar pool heater but managed to do it using fairly cheap parts from the hardware store. It consists of three 100′ lengths of 1/2″ drip irrigation hose, and the way he’s connected them is rather ingenious. 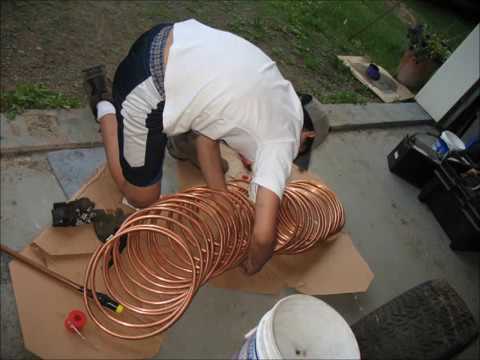 Using a half inch piece of copper pipe and a blow torch, he was able to squeeze the pipe into one hose end and then the other for a permanent seamless connection. He then coiled the resulting hose into a large circle by interweaving string back and forth to keep its shape. A 12V utility pump coupled with a timer allows water to sit in the hose under the sun for one hour, at which point it cycles the system for 10 minutes, pumping the warm water into the pool, and refilling itself with cool water from the bottom of the pool. This one is only made for a small above ground pool, but the design could easily be doubled or even tripled for larger pools. You could also throw in a PID temperature controller or even an Arduino to make it even better… but it sounds like it works quite well by itself with a timer. Combine this with a compost-based hot water system for indoors and you’ll really be cutting the expense associated with your hot water needs! We recycled a semi radiator. Built a hotbox to put it in and plumbed it into the pool pump. If we forgot to open it’s valve it would blow steam for a couple minutes until it cooled down a bit. It would still pump out 80F water until 6 or 7pm. Is a timer necessary? I mean you save electricity… but what if you didn’t care? it would still pick up some heat, but the exit temperature of the water won’t be as high. If you work out the numbers, you’ll find you get way better performance in terms of heat gain if you run the pump continuously. Warm pipe+water=radiation of energy that would be better off in the pool. That is to say, water that is perceptibly warm water coming out of the pipe compared to pool temperature isn’t the most desirable goal. Keeping the collector as cool as possible (within sane pump energy consumption limits) is a useful way of approaching the exercise. Also, heat flow into water is proportional to pipe surface temperature minus water temperature. Or to put it another way: Heat absorption by the water is highest when the water is coolest (obviously, because after an hour it’s barely absorbing any heat). It’s the heat absorption you want, not a small amount of really warm water. Yeah, not sure how a PID would work either as you can’t control the amount of solar head absorbed. The energy in the overall system increases regardless of the flow rate. A PID would be effective at sucking all the solar W/m2 at the lowest pump voltage possible. Seen plenty of these, most of them made of black pvc run back and forth on one side of a south facing pool deck(northern Hemisphere here). Plumbed right in line with the output of the pool filter so no extra pump to worry about. Good idea though using garden hose. I know when I want a drink from the hose it takes a minute or two to run cool. one question, why drip irrigation hose, those constantly leak or am i missing something obvious? Black PVC irrigation hose is the norm for this application. People have been using it successfully for everything from …moving water… to building solar showers for as long as it’s existed. Yeah, that confused me at first too. This is the sort of drip irrigation hose one pokes holes in for drippers, not the sort which is porous all over. This is the 1/2″ (or .700) irrigation tube without emitters. Comes in 100′ rolls. You use this to supply the water to your rows, Then put in tees with 1/2″ tube with emitters every 12″ that emit 1/2 gal/hr. I’m curious why he didn’t use some of these for the connection: http://www.irrigationdirect.com/irrigation-products-and-supplies/drip-irrigation/direct-loc-fittings. I’ve reused the valves & fittings for years in my garden. Maybe a backflow preventer on the end in the water and it could be self siphoning. I guess it”s good to reuse what you have and you save waiting. Would be nice if the hose is placed inside concrete. But then you would have to paint the concrete black. The color of the hose is black for a reason. The reason the hose is black is to keep algae from growing inside due to light exposure as this pipe is often used to supply fertilizer solution to plants, as well as to protect the plastic from degradation due to the UV and other rays from the sun, as the black pigment strongly absorbs the rays instead of the plastic itself. It’s really only a happy coincidence that the hose being black and absorbing sunlight efficiently makes it useful for this application. To … insulate it from the warm sun? What are you getting at here? What about these kinds of polycarbonate boards with cavities? As others have commented, from a thermodynamic perspective, the collector should really be kept as cool as possible. So a high-flow, parallel-short-lengths design is better than a low/intermittent-flow, single-pipe topology. Even if the output is not noticeably warmer than the input in the former approach. Also, insulating the bottom side against both radiative and conductive losses does help. Bought a house with one of these on the roof. Keep in mind that not all black pvc is UV resistant, and if it does deteoreate (especially if you leave the pump off in the African sun, you might get water in places you like to keep dry. So prep the surface just for incase! 1. I only turn my water heater on when I need it – otherwise it remains off. 2. I live in Arizona – where currently (middle of summer) the “cold water” tap is actually a “warm water” tap most of the time, and a second “hot water” tap in the middle of the day. My father built something similar to heat our home in the winter when its cold yet sunny out. I can say this, heat exchanges of this sort work very nicely. This summer my father overhauled the pannel and built a new one as well. The key is to have the exchanger piping nearly free floating and not touching anything but air in a hot box with black walls and aluminum back. I have measured temps reaching 65c out of the box in the middle of the winter when outside temps were -5c. In the summer we cover them with reflective sheets. I am working on automating the 120mm fans that my dad mounted on the unit. A simple thermostat that thinks it is cooling set to 25c will operate the fans. Should be allot of fun. My father set this up to be an air to air heater for the home. With a bit of tweaking to his design you could run an air to water heater in the winter and store the energy in an old insulated boiler and then recirculate the hot water through the night keeping the home warm. One more thing, I agree that if there is sun light the pump should run indefinitely. You get a better energy capture when the differentials are larger. As for energy a small pump with a small solar panel could be the trick, you would not even need a timer for this sort of work. Years ago, like in the 70’s I remember my dad built a parabolic 10 ft long solar collector with a finned piece of 3/4 inch copper pipe in the middle (basically a radiator section). In the middle of winter, if you could keep the snow off the window face, that thing would boil water on a half decent day. Cloudy it didn’t do much, but otherwise, it would put off some heat. A wind storm eventually flipped it over on the patio and did it in. I remember that day/storm actually. Yup, it has been too cool this year to really use my pool much. I guess it is still pretty to look at. I won’t go in when the water temperature is below 85°F. It just isn’t relaxing then. It seems like this isn’t less expensive than a pre-made collector, at least per square foot. A 4′ x 20′ collector is $200, or for .5″ the equivalent of about 20 100′ rolls of tube, or about $10 per 100′ roll. Wouldn’t a pool quickly lose all that heat you’ve added during the night? Seems like a lot of surface area exposed to the night. I bet you’d have to make sure to cover it every evening before you get much benefit..
That’s a great product, I will use for my above ground pool. we all use pool heater to warm the pool water in summer but this heater consumes a lot of electricity. This pool heater uses renewable energy like solar which really impress me. Dont go too big though. One or two coils added to your pool pump should be fine. I added 8 x 100m (20mm dia) coils to my pool. Laid them out on the flat roof next to the pool. The internal resistance of 800m of 20mm pipe is enormous. I ended up adding a secondary pump (6 bar) and still ended up with terrible flow rate because of the resistance.